When Do You Need a New Furnace? Cool weather comes late and leaves early here in Southern California. It’s one of the reasons life in our part of the world is so lovely: mild, short winters are much easier to handle than the deep freezes and blizzards back east. But heating systems are still a necessary part of life here, especially at night when temperatures can drop below freezing. With temperatures steadily dropping, now is the time to make sure your heating system is ready to go for the winter. The best way to do this is to schedule a servicing session with a trained technician. Doing so can not only help you get a jump on repairs, but can save you money on a number of other costs as well. Here’s how it works. You likely schedule regular tune-ups for your car, and visit the doctor and the dentist for check-ups. With heaters, it’s no different. A servicing session is not strictly a repair session: those are designed to address a specific problem. Instead, they give the technician a chance to look over the entire system and look for any potential problems that might crop up. In some cases, those problems can be easily corrected as part of the servicing sessions. For example, it ca bolt has become worn and loose, they can be replaced with a new one very easily. The same holds true for things like clogged burners of filters in need of replacing. In the event something more is needed to get the heating system into shape, you can schedule repairs with the technician once the servicing is done. The repairs can even be conducted right away, assuming the necessary parts are in the truck or can be procured swiftly. A servicing session provides three specific benefits to your heater, which will pay dividends as the weather continues to cool off. Lower Bills. Taking care of little issues like loose bolts and clogged burners means that the heater will warm the home more quickly than it might otherwise: costing you less in fuel to do so. That helps keep those monthly bills low and lets you get through the winter with a little more money in your budget. Easier Repairs. In some cases, servicing can prevent repair calls from ever being necessary. In the event that repairs are necessary, a servicing session lets you spot the issue early. That lets you get them fixed according to your timetable, instead of having to rush around in the face of a breakdown. It also means that the repairs are often less expensive since the problem hasn’t had as much time to spread. Longevity. When applied regularly (once a year or so), servicing session can mitigate the damage of wear and tear over time. That means that repairs later in the system’s life don’t cost quite so much, and that the heater itself could last much longer than it would without regular servicing. 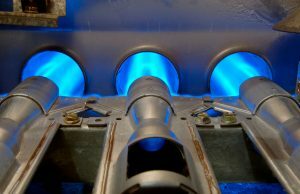 For quality heater servicing in Glendale, CA, call the pros at Greenleaf Heating & Cooling today!